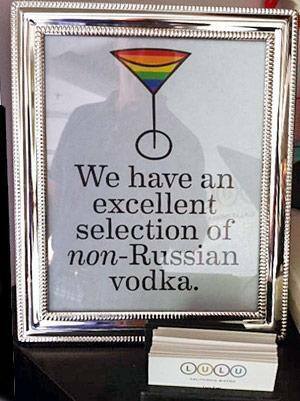 I have remained silent over the recent russian vodka boycott while I took some time to wrap my head around it all. The new anti-gay and anti-human rights laws passed in Russia are down right appalling. Will boycotts of Stoli really help make a difference? And is singling out a brand that has been supporting LGBT events and causes for some time really the best way to go? I am still not sure of the answers to these questions. I do know this, something has to be done. The new laws in Russia make it illegal to even say the word GAY or hold a rainbow flag. What if a child is reading a book with a photo of a rainbow? Will that child be attacked for having a “gay” symbol? They actually could! and that is frightening. Stoli released an open letter in which they try to distance themselves from Russia and stand behind their LGBT marketing campaigns. However, when the owner of the company is named as one of the richest men in Russia, how dumb do they take us for believing they aren’t Russian owned? I would have more positive feelings if they said, “we are Russian owned and we urge Putin to re-think the laws.” That is how you step up and truly show your colors on where you stand on the issue. By simply saying that though, any employee of Stoli working in Russia, could be arrested for spreading gay propaganda. Jail time can be a deterrent for stepping up and maybe that is the case here. Sometimes a high-profile arrest gets a movement going in to full gear. If a Stoli executive was to be arrested for standing up for human rights and waving a rainbow flag at the Russian capital that would make a statement. I am still torn about fully endorsing a vodka boycott and for me a Russian boycott in general is more impactful. We should buy more consciously and look at what we are purchasing. Are the shoes we are buying coming from a place with horrible working conditions? Are we buying meat from a farm that has poor animal treatment practices? Is the country of origin lacking in human rights protections? Clearly Russia currently lacks respect for its citizens and those who are LGBT or LGBT allies. A boycott of all Russian goods sends a bigger and broader statement in my opinion then singling out one brand. A brand, I remind you, that spends money in the LGBT community. After looking more into this I thought about the upcoming Olympics in Sochi, Russia and a boycott that could have a far wider impact on Russia. What if McDonalds and Coca-Cola were boycotted? Two of the largest brands in the World and largest Olympic sponsors. The mission of the boycott would be to get them to pull their agreements with the Olympics. The IOC (International Olympic Committee) would have to take notice then and really stand and do something. Could there be an Olympics without all the funds provided by two of the main sponsors? The IOC’s website says “Revenue generated by commercial partnerships accounts for more than 40% of Olympic revenues and partners provide vital technical services and product support to the whole of the Olympic Family.” Sounds like they need these sponsors to me. If the IOC was faced with sponsors pulling out ahead of the 2014 games in Russia, I would believe they would move fast in getting Russia to re-think the laws. The IOC has ties to every major government in the World and with their help can get a coalition together to pressure the Russian government. Now that is how you make change. So while a boycott of Russian Vodka may make headlines in the current news hour, what will truly affect change in Russia? It’s all up to each individual to make at their own decision in this matter. Can you just imagine two of the largest brands pulling out of the Olympics? Now that is a statement on protest that I would be happy to see. So who is with me? What dates should we all boycott McDonalds and Coca-Cola? Two weeks with out their products could hurt their bottom line. Leave a comment believe, I am interested to see what ou think of my two cents. Till next time stay safe, share a smile with a stranger and LIVE LIFE NAKED! Posted on July 29, 2013, in Uncategorized. Bookmark the permalink. 3 Comments. I have been boycotting coke n mcdonalds for decades….